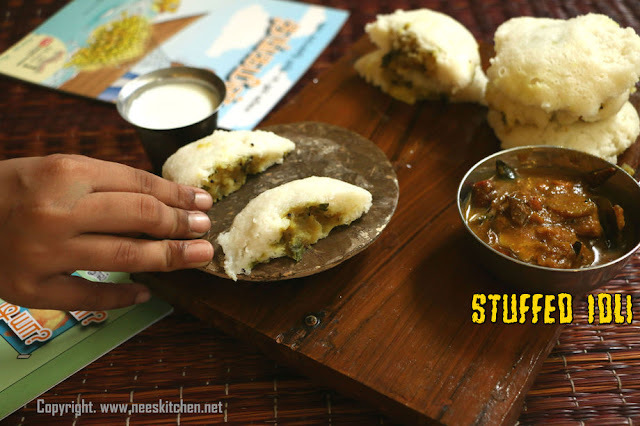 Idli is a regular breakfast or tiffin in any south Indian house. One of my friends passed on this recipe and it became hit in my home after I made it. This post is with potatoes however you may try to add any vegetables as long as they can be made as a tight patty. You may pack this for lunch box too and it remains soft. 1. Prepare the idly batter in your regular style. 2. Boil Potatoes, chop onion, chili, ginger. 3. Take a pan , add oil, hing, mustard. Let the mustard splutter. 4. Add green chili,garlic, ginger and curry leaves and fry them for 1-2 mins. 5. Add onion and fry them until translucent. 6. Add potato by mashing them and turmeric powder. 7. Cook until all the masala’s mixes well and the gravy becomes thick. 8. Divide them into 16 equal balls and flatten them like round patty. 9. Take idly container and pour a little more ¼ of the idly cup with the batter. 10. Add the potato patty on top of the batter. 11. Cover the remaining cup with idly batter. 12. Steam it for 15 -20 mins or your regular time. 13. Switch off the gas and leave it un covered for another 5 mins. 14. Scoop out the idli’s. You may cut them into half to give it to the kids as it looks more attractive. Serve it with a good chutney of your choice. If the potato comes out of the idly it means that it needs to be covered with more batter. You may steam with the regular idli steam time as the vegetables inside are already cooked.